Your favorite director M. Night Shyamalan made a scary movie about a grandma and sure enough, Hollywood pointed a bony finger our way and said "you do something spooky too." That Hollywood really does come knocking everyday. And it always wants to talk about dead people. We'll be talking to famous dead people this Wednesday night 10/28 at Call Me On the Ouija Board (A Burlesque Comedy Seance) at The Producer's Club from 10pm-midnight. We have a pink Ouija board (it was on sale!) to summon the dead and of course we'll have your grandma's hands, brains and hearts cast in Jello for you to feast upon. We hope you're having a lovely fall. We had a fabulous time with our grandchildren at the Masked Marvelous Ball & the Lower East Side Pickle Day. And here's us singing "Maybe" from Annie for Send in the Clowns at 54 Below. We miss you and remember, if you have a friend who needs a Fantasy Grandma, we take referrals. Look at your Fantasy Grandmas surrounded by demons. Holding nothing but a pink toy we borrowed from a teen girl Satan. Come see us on October 28th at 10pm for Call Me On the Ouija Board. 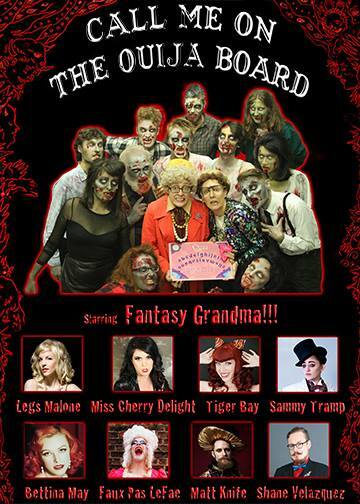 There will be comedy, Fantasy Grandma music, naked young people, and ghosts. We'll be making delicious Jello in the shape of parts of your body so that you can finally eat brains without offending your closed-minded cousin who hates zombies.